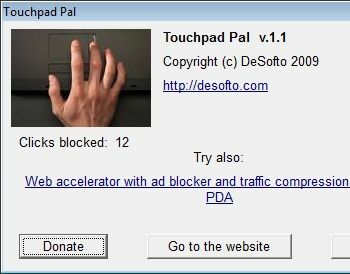 I pride myself on being the cure for disgruntlement, so here's a solutuion: TouchpadPal, another freebie that automatically disables a laptop's touchpad when it detects any keyboard activity (like typing). And unlike TouchFreeze, TouchpadPal is compatible with Windows XP, Windows Vista, and Windows 7. If you've been tearing out your hair over accidental brushes of your touchpad, this simple utility should do the trick. By the way, although it's free, the author does encourage donations--and so do I.